These were my Easter Sunday peppers, the kind of dish you throw together with stuff you have in your pantry. I had some black garlic that was starting to dry out and needed using – and do read up about it (details below) – and I always have pine nuts and golden raisins and marjoram in the garden. Viola! A tasty dish is born. 1 Soak raisins in hot water to cover for 30 minutes. Preheat oven to 200°C (400°F). 2 Cut peppers in half through the stalks. With a small sharp knife remove seeds and white membranes without piercing the pepper flesh. Transfer peppers to a shallow roasting tin lined with baking (parchment) paper. 3 Cut tomatoes in half and put two halves in each pepper. 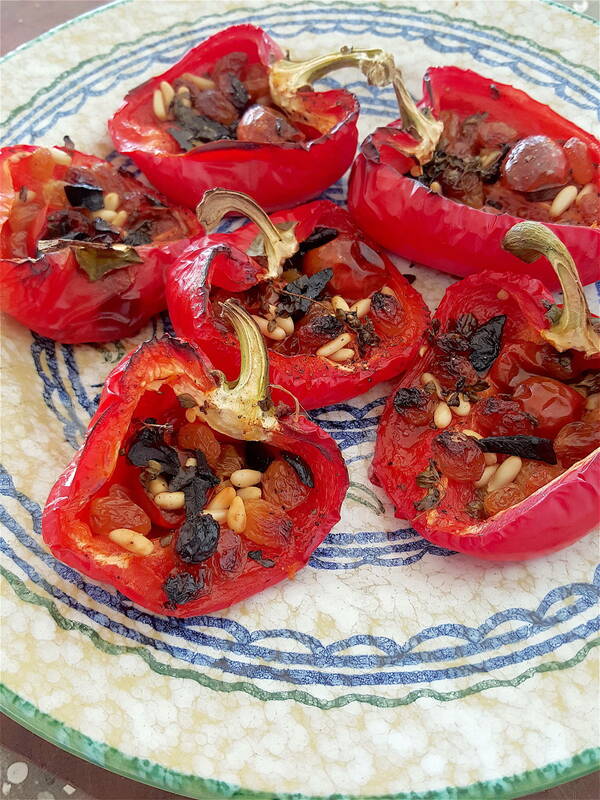 Drain raisins and slice black garlic and distribute amongst peppers. Sprinkle with pine nuts and marjoram. Season with a little salt and pepper and drizzle with a little oil. 4 Bake peppers for 15 minutes, then lower the heat to 170°C (325°F) and cook for a further 15 minutes or until peppers are lightly charred and the flesh is tender. Serve hottish or at room temperature.